(Nanowerk News) Bioengineers at Harvard have developed a gel-based sponge that can be molded to any shape, loaded with drugs or stem cells, compressed to a fraction of its size, and delivered via injection. Once inside the body, it pops back to its original shape and gradually releases its cargo, before safely degrading. The biocompatible technology, revealed this week in the Proceedings of the National Academy of Sciences ("Injectable preformed scaffolds with shape-memory properties"), amounts to a prefabricated healing kit for a range of minimally invasive therapeutic applications, including regenerative medicine. “What we’ve created is a three-dimensional structure that you could use to influence the cells in the tissue surrounding it and perhaps promote tissue formation,” explains principal investigator David J. Mooney, Robert P. Pinkas Family Professor of Bioengineering at the Harvard School of Engineering and Applied Sciences (SEAS) and a Core Faculty Member at the Wyss Institute for Biologically Inspired Engineering at Harvard. Consisting primarily of alginate, a seaweed-based jelly, the injectable sponge contains networks of large pores, which allow liquids and large molecules to easily flow through it. Mooney and his research team demonstrated that live cells can be attached to the walls of this network and delivered intact along with the sponge, through a small-bore needle. Mooney’s team also demonstrated that the sponge can hold large and small proteins and drugs within the alginate jelly itself, which are gradually released as the biocompatible matrix starts to break down inside the body. Normally, a scaffold like this would have to be implanted surgically. Gels can also be injected, but until now those gels would not have carried any inherent structure; they would simply flow to fill whatever space was available. “Our scaffolds can be designed in any size and shape, and injected in situ as a safe, preformed, fully characterized, sterile, and controlled delivery device for cells and drugs,” says lead author Sidi Bencherif, a postdoctoral research associate in Mooney’s lab at SEAS and at the Wyss Institute. 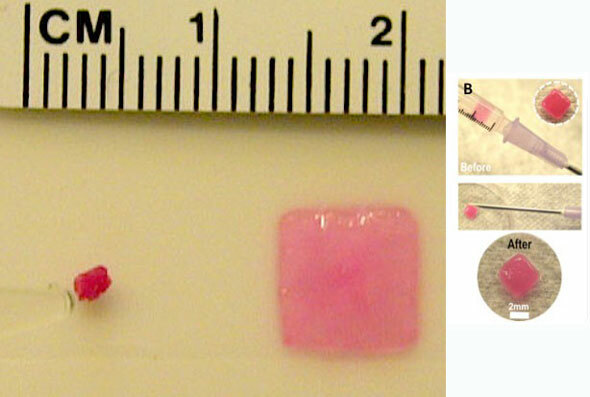 Bencherif and his colleagues pushed pink squares, hearts, and stars through a syringe to demonstrate the versatility and robustness of their gel. The spongelike gel is formed through a freezing process called cryogelation. As the water in the alginate solution starts to freeze, pure ice crystals form, which makes the surrounding gel more concentrated as it sets. Later on, the ice crystals melt, leaving behind a network of pores. By carefully calibrating this mixture and the timing of the freezing process, Mooney, Bencherif, and their colleagues found that they could produce a gel that is extremely strong and compressible, unlike most alginate gels, which are brittle. The resulting “cryogel” fills a gap that has previously been unmet in biomedical engineering. The next step in the team’s research is to perfect the degradation rate of the scaffold so that it breaks down at the same rate at which newly grown tissue replaces it. Harvard’s Office of Technology Development has filed patent applications on the invention and is actively pursuing licensing and commercialization opportunities.